Well it looks like we have a little bit of an interesting storm signal for the region next weekend into early the following week. Models have hung onto the ideal of a coastal low for quite some time, but the Euro is really ratcheting up the threat with some optimal temperatures on the 12z run today. We'll want to keep a close eye on this one..
Wow! We are starting early again this year! That needs to move down to include Columbus. Not until the 9th though. My daughter has a ballet recital on the 8th. Definitely looking intriguing come Monday. Nice deformation band with very strong cold air advection. Surface temps are questionable, but it is VERY cold aloft. 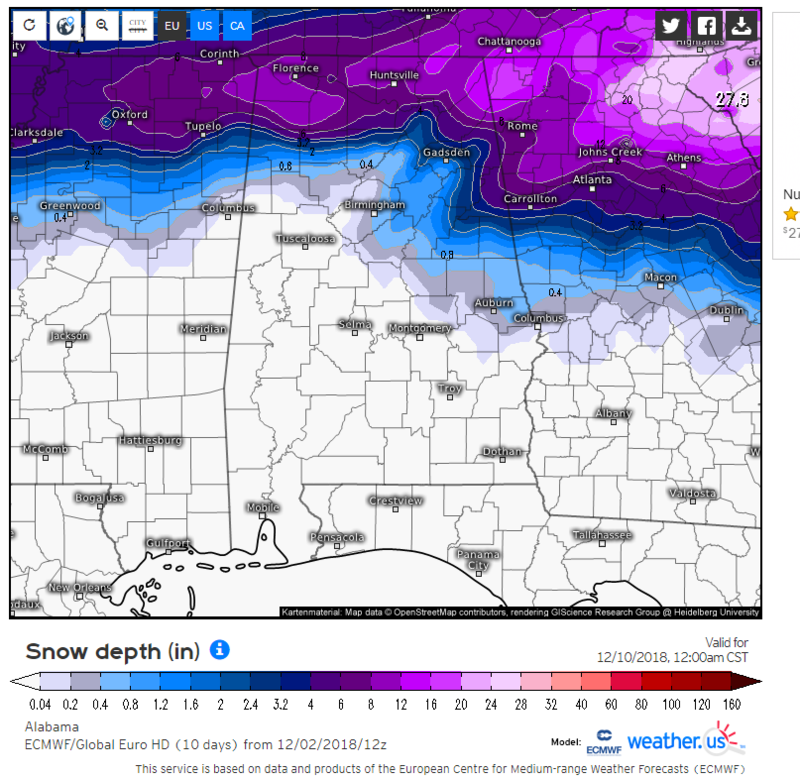 Keep an eye if you're in North/Central AL, TN, and North/Central GA.
GFS keeps going back and forth on it. 12z run today shows Atlanta with about an inch. A run yesterday showed nothing. Does anyone have a ECMWF site with winter parameters (snowfall forecasts) that are "Free"? A good weekend to go to Sugar Mountain! Haven't been by in a while.. figured I'd stop by and see what everyone thoughts were for the weekend? Sure seems like tonight's NAM run has a much more realistic handle on temps/dews with the CAD than the other models for sure. Anxious to see how the runs evolve over the next 24-36 hours. Parts of western North Carolina are forecast to possibly get 2 feet of snow. What is the weather looking like for north Alabama on Monday? I love the topic title!! Big flakes falling here. Beautiful snow shower. It’s trying to stick.